Dolores Ibarruri Gomez, best known as La Pasionaria, was born in Gallarta on 9 December 1895. She is essential in order to understand European politics in recent years. At the end of the Spanish Civil War in 1939, she exiled to the USSR. 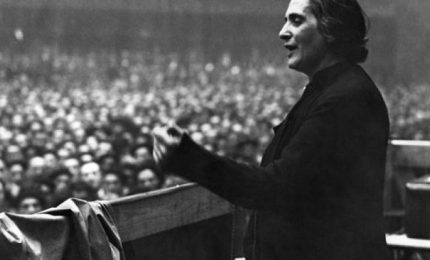 During her exile, La Pasionaria was elected Secretary General of the PCE (Communist Party of Spain) in 1942. She was the maximum authority among the PCE members exiled in the USSR. In 1960 she resigned and became the president of the PCE. She was a member of the International Communist Secretariat and supported Moscow on the occasion of the various disagreements within the international communist movement. In addition to her political struggle, she also struggled for women’s rights, to show that women, irrespective of their condition, were free to choose their own destiny.